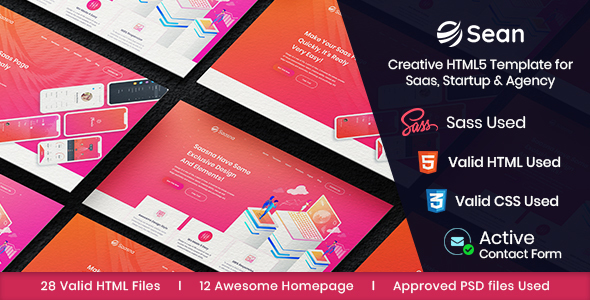 Sean Saas, Software & App Landing Page HTML Template is designed perfectly in Bootstrap 4, SASS, CSS3, HTML5. This is HTML Template design which is perfectly suited for Software & App Landing Page, Showcase template. It has been created following modern design standards and typography. All the files are editable and we also included noob friendly documentation so anyone can edit them! Please Note: Images in the main file are replaced by placeholders, all images used for demo purpose only. Don?t worry about elements, shapes and graphic, it is allready in your main file.